Cake Shop bakes up its own special brand of Time Management fun! Slap together the different layers of tasty cakes for your customers. Manage customer patience with the help of piping hot coffee and cotton candy that will put a smile on the faces of their children. As your skills as manager of the shop improve, you'll be able to spend your profits on better equipment and even a new home where you can put up your tired feet after a hard day. Cake Shop has all the ingredients for a good time! Delightful treat for all ages. Cake Shop is rated 4.2 out of 5 by 15. Rated 5 out of 5 by OhmOmair from Lovely Game; Much Like Burger Shop Before purchasing a game, I look at the video and read the reviews; a few times I have gotten a game that I didn't like and did not meet my expectations, but this is not one of the games. Happily, I played this game for *hours* - reaching the finalisation of Emily's home, which is gorgeous, and gaining the expertise for assembling cake orders which was a little confusing at first because of the textures were similar in appearance and it takes repetition to achieve a knack for speed. I thought this was similar to Burger Shop in that the customers enter the shop - up to three at a time, once one leaves - as well as the drink and ice cream machines, which I fill first but are not always requested. I like the building of Emily's home - a specific amount of money is required for each item (foundation, swimming pool, lighting, gates, gardening, windows, etc.) and this reminded me of Diner Dash 4 - I mused that such a home is fit for the owner of the cake shop and not the manager (Emily). The reason I did not give the storyline an excellent rating is that it was a little annoying that until Emily's home is built, each level she sighs and her mood is normal to bad. I did not like that the game instructs the user to chose building the home over purchasing shop items and I have not finished the game but am uncertain what is next now that the home is built and I reached the maximum achievement level. I have purchased Cake Shop 2 and 3 but in playing CS2 discovered that the items are on a conveyor belt, much like Burger Shop and Burger Shop 2 which kind of takes away the hominess of the original Cake Shop. Rated 5 out of 5 by luvatrivia from Great for a Beginner Who Wants to Do a Beat the Clock Game I loved this game from playing it in the trial run. As a beginner to this type of timed game, this game made me confident. I had tried other games of this type and became frustrated. Now I have moved on and bought 2 and 3 in this series. This is the only series I have gotten every game in the series. This is a great starter to the series. 2 is more challenging and 3 is rather hard. The only cons to the game I think are when you build your home up bit by bit; It ends far too quickly; Then you do not have this fun aspect of the game anymore unless you start over. They also really push you to build for your well being. The other parts of the game are putting 3 parts of the cakes together and the fun of adding drink machines, cotton candy, popcorn with the money you earn. This game has now made confident enough to move onto other more hard games of the same type. 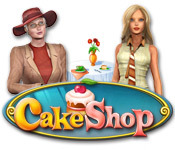 as well as the steps up to more challenge in the 2nd and 3rd levels of Cake Shop games. Rated 5 out of 5 by roxiepoxie1989 from two modes in one..... almost I LOVED LOVED LOVED this game, to begin with i was a bit reluctant to carry on as i read in the dialog that if you didn't balanace the house build with proportion to also upgrading your cake shop the customers would become more impatient. however this is quickly overlooked, and i went back to it and finished the game. the two games in one comes from the balance between managing your happiness with the house build and the upgrades within the shop. the only drawback is it's short those of you who are comfortable with time management will find this game easy, im not an expert with time management and i still managed to complete the game within 52 game days. which is a bit of a let down as i wished the game was longer. i will definately buy two and three now i know that this game is super fun and although easy it is relaxing. Rated 5 out of 5 by Allieshannon from fun game This is the best game ever! But you have to go fast when you play it. Rated 5 out of 5 by Pucktweety from Very, very fun! I found this game to be extremely fast paced from the start, which I really liked (no sitting around twiddling your fingers waiting for customers) and I also thought it was really fun. The graphics where trying a bit too hard to be realistic but still great. The game play was smooth and it was very easy to get the hang of things. The right click delivery system was the thing that made this game stand out as it made it seamless to play and I really loved that. I would rather there be slightly harder levels towards the end as once I had gotten the hang of everything I was able to sail through the faster paced levels but it was still a really great game! Rated 4 out of 5 by coffeyfan77 from Solid Time Management Game Food-themed time management games are plentiful, but Cake Shop manages to be pretty good at most elements that make the genre fun. Your character opens a standard café and uses the money collected each day in order to purchase additional equipment. While doing that, you simultaneously build your house from the ground up, which is a cool added feature that makes it a bit more personal. You have to balance both ends, as the house building is required in order to keep your mood high. I like that everything is reasonably priced, and you should get through the whole game in about 40-50 levels, not bad for a time management affair. You also get a pretty solid sense of accomplishment for constructing the house. There's not much character development, the dialogue is very simple, and the actual in-game challenge of completing a level is not too bad at all. It's actually very hard to lose customers, especially if you set your stuff up in advance at the beginning. It's not perfect, but it's a solid play. Rated 4 out of 5 by ljrudd from Great I really enjoy games like this for those days I don't want a super challenge but don't want something so simple I go into a coma. The Cake Shop games are just right for me. These games take some time to complete all levels and offer some challenging combinations. The game is visually appealing, not so busy it is distracting to look at, but not of a cartoon style or simple that I feel like I am playing a game for a toddler. I typically don't turn on the sound for games, but the soundtrack for this one is pretty redundant and fortunately I can play silently, so this is appealing to me. Overall, I really enjoy the game, but I believe the sequels are better so I gave this one 4 stars.